Nintendo has always been a video game manufacturer renowned for innovation. From revitalising the video game console industry with the NES back in 1985 right through to opening it up to the mainstream with its Wii and DS systems in the mid-2000s, the Japanese company has continued to have a major impact as a result of its never-ending creativity. However, it was one of Nintendo's smallest innovations that arguably had the biggest impact of all (and quite literally, too). The Rumble Pak — which was released across the world in 1997 for the Nintendo 64 — may be a small device that clips into the bottom of everyone's favourite three-pronged controller, but the role it played in shaping the industry was considerable. What was at the time a novel and perhaps gimmicky force-feedback add-on for the system soon became an industry-wide standard. Fast-forward to the present day and every major video game console manufacturer offers force feedback functionality as standard. It's a feature that is now expected by consumers. In fact, Sony found this out all too painfully when it launched the PlayStation 3 in 2006 without a force-feedback controller (although this later changed with the release of the DualShock 3 pad). Rumble may seem like a minor additional feature, but it's something us gamers have grown to love and — strangely enough — our game pads just don't feel the same without it. The Rumble Pak wasn't perfect, but it was a first great step. Moreover, its flaws were excusable given that it was released over 16 years ago. The biggest issue was that Nintendo's official Rumble Pak required 2 AAA batteries (some third-party packs used the system's power, but they never quite provided the same kick). This made the Rumble Pak more expensive to use, especially because the battery life wasn't very long. Otherwise, adding a big chunk of plastic with two batteries in it into the bottom of the controller made the whole pad feel heavier. The weight isn't uncomfortable by any means, but it's certainly noticeable. Needless to say, these very minor flaws didn't hinder most players from enjoying the peripheral. It was hugely supported by both Nintendo and third-party developers, meaning that unlike some other add-ons for the system, it was much easier to justify laying down your hard-earned cash for one. The Rumble Pak may now be a relic of the past that has been superseded by far superior vibration-feedback controllers, but it deserves an honourable mention. Just like the system it was designed for, the peripheral brought us an exciting new experience, and one which – incredibly — has remained a core part of gaming even to this day. 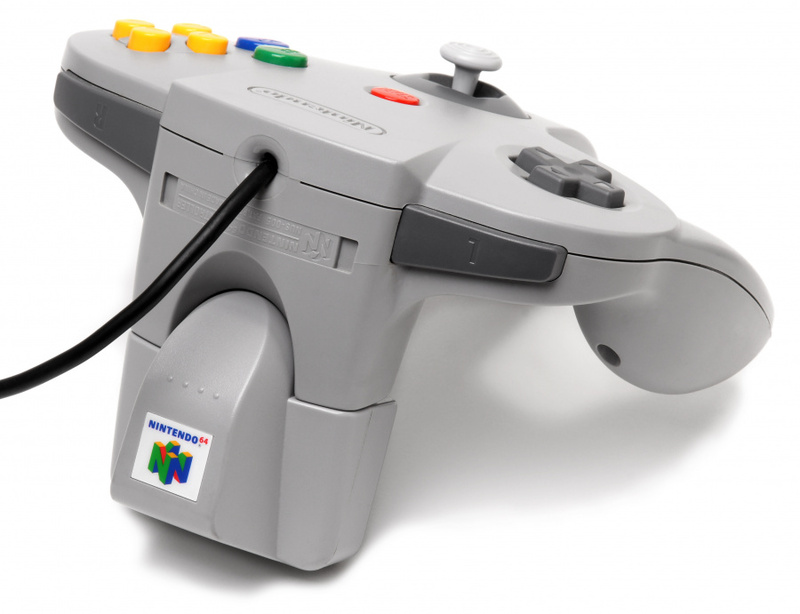 Star Fox 64 — or Lylat Wars as it was known in Europe — was the first game to use the Rumble Pak and was clearly designed with the peripheral in mind. As you zip across the Lylat system in your Arwing, you can feel every hit, collision and crash along the way (although you are meant to prevent such things from happening!). For a game that was so cinematic at the time, the rumble effect really helped with the immersion. It's a bit like one of those 4D rides you get at theme parks and attractions, albeit with a less cheesy setting. Firing a gun in GoldenEye 007 was a glorious experience as a result of the Z-button, which oddly enough was also pretty ahead of its time. Adding a Rumble Pak to the mix made such moments even more epic. Whether it was the sudden recoil after firing your PP7 or the continuous judder of an RCP-90, firing a virtual gun had never felt so good up until this point in time. Unfortunately, most gamers in the West never got to experience the Japanese exclusive, Wave Race 64 Rumble Version. Released in July 1997, it's surprising how much of a difference the Rumble Pak made to the experience. Even without the Rumble Pak, Wave Race 64’s physics are so impressive that they inexplicably make you feel every single wave you come up against. But when you also throw in the vibrating peripheral, the whole experience gets even more realistic, and it's fair to say that this is without a doubt the definitive version of the popular Jet Ski racing game. While getting punched or kicked in real life isn't usually the nicest experience, it's simply awesome in Super Smash Bros.; every blow sends your controller into an absolute frenzy. If anything, having the Rumble Pak in is advantageous, because in this frantic game the force feedback acts as a great indicator for when you've been sent flying! Of course, the most satisfying moment is when you win a match and your controller rumbles just a split-second before all is revealed on-screen. Feeling that controller shake is relieving, probably because it’s also gently massaging your fingers and thumbs after an intense battle. What are your fondest force feedback memories? Share your thoughts with us in the comments section below. Ah... The Rumble Pak. Can I say much more? I never understood the whole rumble appeal and never liked using it, I always turned that off in my Wii games as well. Ocarina of Time is the first game that comes to mind when talking about the rumble pak. The fishing mini-game and sword battles came to life thanks to the peripheral, and it was just another reason why OoT was so amazing for it's time. Love the Rumble Pak - something satisfying about clicking it into place - love its use on Rogue Squadron - nothing quite like crashing in glorious death to the rumble and audio sensations. Can't say more,but Super Smash Bros. is awesome! I am not bothered either way I don't turn off the rumble though on wii games. One word of warning: if you are prone to RSI complaints, do not use Rumble as it adds a great deal of stress to your muscles and nerves. i loved it. the rumble pak was expertly used in lylat wars and also was a big part in bringing goldeneye to life. the way different guns genuinely felt different via the rumble was fantastic. it's a shame that rumble isn't considered much these days beyond on/off for the most part. the gamecube controller had a weaker rumble, though more cohesive across the entire pad. the wii U gamepad is weaker still and not satisfying at all, more like a buzz. can't really do much given the size of the pad. the 360 pad has a really strong rumble than i enjoy. playing bayonetta recently, the use of rumble is so well done it's giving me those lylat wars feels. rez HD is another great one, you can have 4 controllers rumbling together just for the fun of it. anyone care to comment on the wii U pro controller compared to the others? I originally thought the rumble pack was just a stupid gimmick. I wanted Star Fox 64 regardless but I quickly fell in love with it, and I was thrilled whenever games I bought in the future used the pack. I cry whenever I have to turn off the rumble feature in Gamecube games today though. My controllers work perfectly fine but the poor rumble pack gives off a whine and a super weak rumble being so worn out. I loved the rumble pack on the N64.. I was maybe 20 years old when that came out, yeah i'm an old gamer. Nintendo has always led the change/innovation in the video game market... something the Nintendo haters hate to admit. Was the rumble pack not bundled with Star Fox 64 in the UK like it was here in the US? That's the only reason I had one really, it came in the huge Star Fox 64 box. "Biggest impact of all", really? The NES certainly had a way bigger impact, as did the first Super Mario Bros, or Mario 64. I'm not trying to downplay the rumble pack, but it's merely a nice add-on. Nintendo has had way more vital innovations. You learn something new everyday, I didn't even know Smash Bros. and Goldeneye had this feature! I really should buy one of these things off of the internet and see the difference for myself. Loved the use of the rumble pak in 1080 Snowboarding... so good. Never liked the Rumble Pak much, the whole needing batteries thing ruined it for me. As a note, the PS1 had rumble support before the N64, the Japanese version of the PS1 Dual Analog controller (released 3 days before the Rumble Pak I believe) had vibration feedback. @Jenraux unless the information I've researched is wrong, I think you're looking at the release date for the PS1 Dual Analog controller and not the DualShock controller; the former was released a couple of days before Star Fox 64 in Japan, but did not feature rumble. The DualShock controller (which did feature rumble) arrived later that year, after Star Fox 64's release. The alternative ending on Macbeth in Lylat Wars/Star Fox 64 single-handedly validated the rumble pak. BOOM! I remember getting my first rumble pack with Star Fox 64 back then. It was so cool. I miss those days. @MegaWatts the Japanese dual analog did feature vibration feedback, but it was removed from the European and American releases, and reserved for the dual shock. Didn't care much for this. The only pad peripheral that ever got any usage from me, was the Transfer pak (as a kid obsessed with Pokemon). @Jenraux right you are! Silly thing is I had read that previously! Funny how Sony beat Nintendo to market, although I imagine the considerable lack of games, not to mention Nintendo having to wait for Star Fox, before it could be released, didn't help! I remember getting the promotional VHS in the mail telling me all about the Rumble Pak. It had some embarrassing skits featuring a pair of witless spies from Sony and Sega trying to get the dirt on Starfox 64. I also got a promo VHS for Banjo-Kazooie, narrated by Jon Lovitz. I wish I still had those stupid things. Some collector would love to have them, I'm sure. @SteveW ...games without rumble? why would anyone do that? loud sounds create bass effects in your speakers and your ears FEEL that, so why can't they add the same factor of immersion for game events that shake? personally I love the added weight the rumble pack adds, and then I go to play with it off and I'm like "omg it's too light"
I had 4 of these things with rechargeable AAA batteries. I liked the rumble, and got used to the weight. I didn't want to play without it after having it on there for a while. @Marioman64 To me, the rumble feels too fake, it feels more like a motor spinning around inside the controller than anything realistic related to what is happening in the game. I bought the Rumble Pack (without the battery cover, unfortunately) on one of my many trips to the local swapmeet over half a year ago, I think, and it's awesome. I've only used it a couple of times, but it cost me next to nothing (30 Pesos; that's about two dollars), so I think it was definitely worth the purchase. Especially since most of the titles I own for my Nintendo 64 support it. Wheel of Fortune was awesome with the Rumble Pak! Spinning the big wheel caused the entire controller to shake. It really added some personality to an otherwise rather boring game. Best part is you can hack them to require no batteries. I'm not sure if the battery reason was ever solved but it may have to do with there not being enough amps available for 4 controllers with rumble-packs but there is enough voltage. @Hetsumani Aaaarrrgghhh! Don't spoil it all for me! I liked the idea Stone of Agony in OoT. You could only find certain secrets if the rumble pak was inserted. I never had the chance to use the Rumble Pak. It only came bundled with Metroid Prime Pinball in Australia, and I never got around to getting...whuzzat? Oh, we're talking about the Nintendo 64 Rumble Pak! I thought you said "Nintendo DS-teefour"...whatever that is. Anyway, I remember the good times playing Lylat Wars with the Rumble Pak, the rewarding vibration that came with blowing up the Sarumarine or preventing Independence Day from being filmed on Katina. I also wanted to try out the rumble features in Ocarina but I never figured out how to find the Stone of Agony. I liked the rumble pack feature but it makes the controller quite big and heavy because of it. I loved when I saw this integrated on the gamecube controller. I bought the rumble pack after finding the stone of agony on OOT, I didn´t wanted to miss anything of the game, but I enjoyed it more on other games. @Mikau94 Actually, that was one of the few games that gave it a more worthwhile purpose. Same for Majora's Mask too, right? @Doma Yes, but you in Majora's Mask you started the game with it. I hate that the classic controller Wii doesn´t has rumble. Lazy Nintendo.